"Wonderful things for your home & garden"! 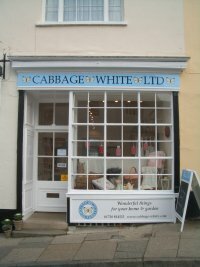 Cabbage White's philosophy is simple: they only sell things they absolutely love! They will continue to bring you attractive and unusual things for your home and garden with new goodies arriving every week - so you can be assured of fresh inspiration every time you visit. Situated in the heart of Midhurst's beautiful Old town, their Grade II listed shop is positively brimming with wonderful English & Scandinavian inspired china, cushions, table-linen, cutlery, glass, bed-linen, gardening things, children‚s stuff and much more from the likes of Susie Watson, Jersey Pottery, Linum, Baileys Garden Trading and Hogben Pottery to name a few.